A clean and integrated form (shown with ClassiPress but works with all our themes). Option to use the Stripe modal window (shown using Vantage but works with all our themes). Easy to setup and customize from within your AppThemes admin area. Saves detailed customer information with each Stripe transaction. 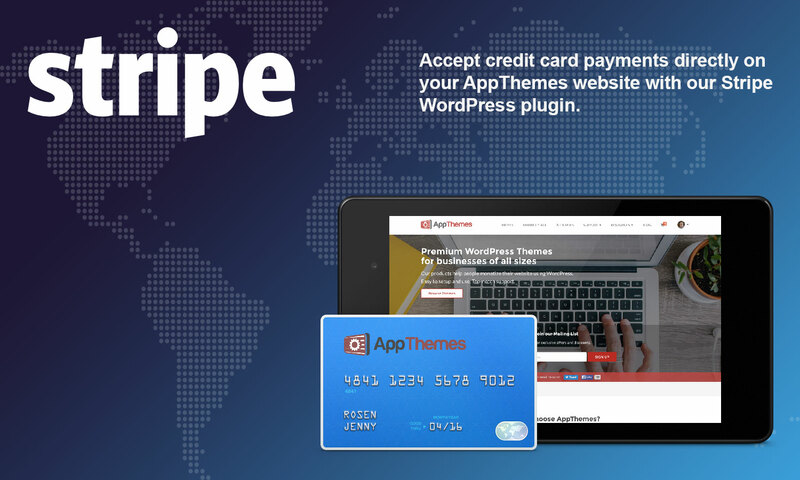 Join hundreds of other AppThemes customers and start using the top selling payment gateway plugin! Stripe is the #1 alternative to PayPal and for good reason. It’s an easy-to-setup and completely integrated payment solution for your AppThemes business website. Unlike PayPal, there are no confusing off-site redirects so the customer checkout experience is seamless. You also own your customer and credit card data so it’s portable and flexible (e.g. you can export it and/or manually initiate charges or credits from within Stripe). There are no setup, monthly, or hidden fees. You’ll pay only when a transaction is made. 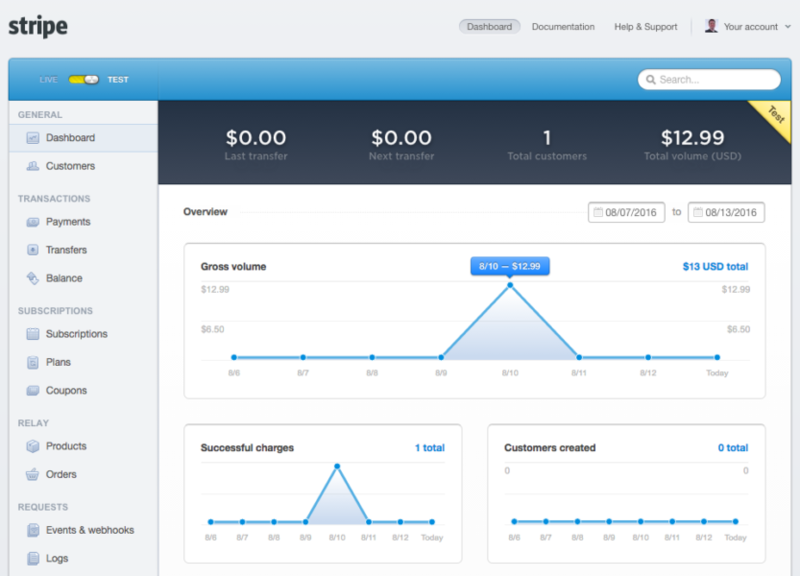 Stripe also provides real-time reporting and other payment management features which are far more superior to PayPal. Transfers arrive in your bank account on a 2-day rolling basis. You can also opt to receive transfers weekly or monthly. Complete theme integration. Customers don’t even know they’re using Stripe. Support recurring payments so you can build your own subscription models within Stripe (theme must support recurring payments). 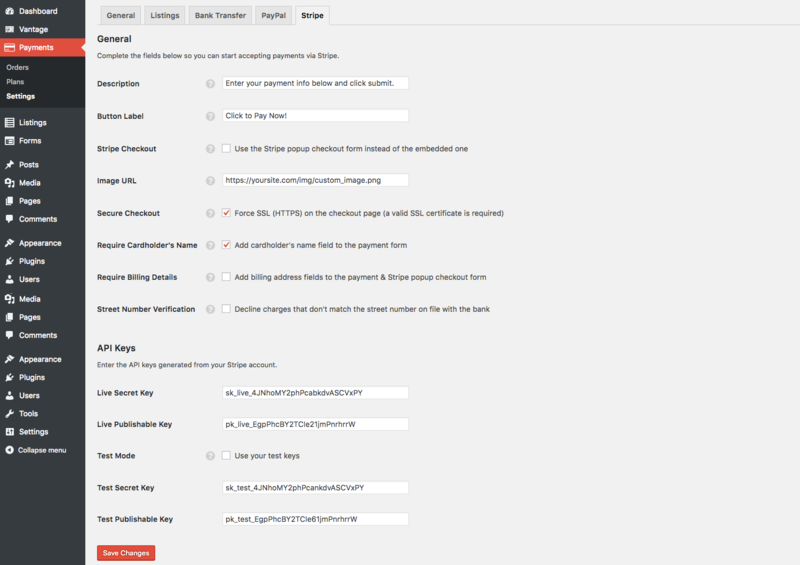 Option to use the Stripe Checkout modal window for a more simplistic checkout experience. Accept payments from Visa, MasterCard, American Express, Discover, JCB, and Diners Club cards. Stripe handles the processing, transmission, and storage of credit card data so you don’t need to worry about PCI compliance. Your customer’s personal information and credit cards are forever saved in Stripe so even if you change themes later, the data is portable. Completely customizable via the wp-admin options page. Include the billing address fields, change the button text, add your own logo, etc. Supports mobile devices and auto complete features for apps like 1Password to pre-fill securely stored credit card data. Validates credit card field inputs and displays the actual credit card brand image once it’s been recognized for a more professional look. Has it’s own API (via WordPress native actions and filters) so 3rd party developers can extend the plugin into their own products. Escrow functionality for Hirebee. View escrow setup documentation. Active Stripe account – It’s easy to sign up. Make sure your country is supported first. See their country support page and confirm before you purchase this plugin. AppThemes product with payments support (all our themes excluding legacy Quality Control and Ideas). Stripe is available in limited currencies. Check their supported currency page to verify your currency is accepted. An SSL certificate for your website (unless you are in test mode). This means https must work correctly. See our FAQ tab for more information. 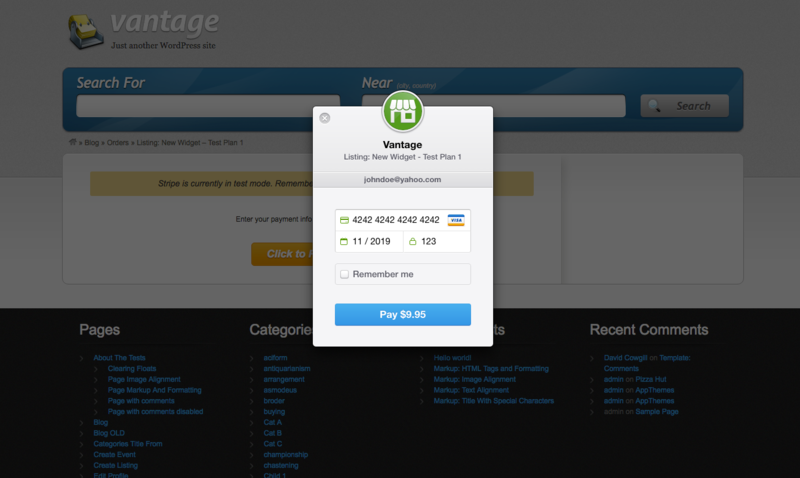 Note: Images above show the plugin being used with Vantage (not included). What themes does this plugin work with? It will work with all of our themes (excludes legacy themes Quality Control and Ideas). How much does Stripe charge per transaction? 2.9% + 0.30¢ per successful transaction. This may change in the future so visit their pricing page for the most up-to-date information. Yes. In order to transmit credit card information, you need a secure connection. This means you must purchase and install an SSL certificate on your website. For more details, see the Stripe HTTPS and SSL documentation. Contact your web host provider for information on how to buy and install the SSL certificate. Prices start from $30 per year. They should be able to handle all the technical details for you without charge. What countries does Stripe support? Currently it supports only major countries but continues to add more. See which countries are supported and/or sign up to be notified when your country is added. Stripe supports many different currencies both for making charges and for transferring to your associated bank accounts, depending on where your business is based. View the list of supported currencies. Does this plugin support Stripe Checkout? Yes. So what is Stripe Checkout? 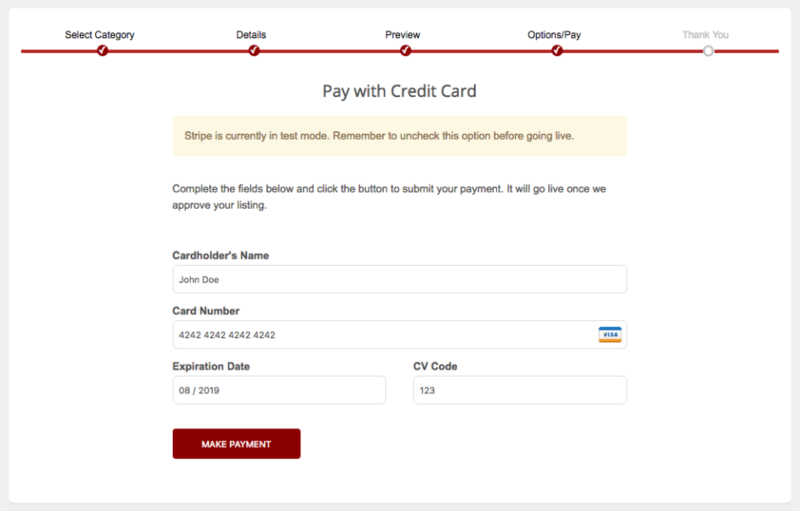 It’s a modal window that is displayed on checkout instead of the integrated payment form. Some customers prefer this as it’s simpler to use. Does this plugin support Stripe Connect? Does this plugin support Bitcoin transactions? No, not at this time but we plan on adding support in version 2.0.0. What version of the Stripe API does this plugin support? As of version 1.3.0, it supports Stripe API version 2017-01-27. You can see the Stripe API change log to understand what has changed since the previous versions. This API version is set via the plugin so the new features will already be supported. You can also login to your Stripe Dashboard API Keys page and click the “upgrade API button”. Just make sure the version matches 2016-03-07 otherwise the plugin may not work correctly. I’m a developer. Does this plugin have it’s own API? Welcome, friend! Yes it certainly does. We use the native WordPress action and filter hooks which allow you to make all sorts of changes. You can trigger workflows after a successful transaction, pass in additional customer metadata to Stripe, insert additional fields on the checkout form, and more! What fields are passed into Stripe? Besides the obvious required ones (credit card number and expiration date), we include the following (as of v1.2.0): email address, ip address, first/last name, WordPress username, and WordPress ID. We also include the billing address fields if you opted to have those as well. Why can’t upgrade to version 1.2.0 with the AppThemes Updater plugin? If you were a customer prior to version 1.2.0, you’ll need to manually download the plugin from your customer dashboard. This is because the plugin’s folder name was changed due to a conflict with a totally unrelated Stripe plugin on wordpress.org. Please deactivate and then delete your existing Stripe plugin. Then upload and activate version 1.2.0+. The .zip file you upload is still named stripe.zip but it unzips into appthemes-stripe on your server. 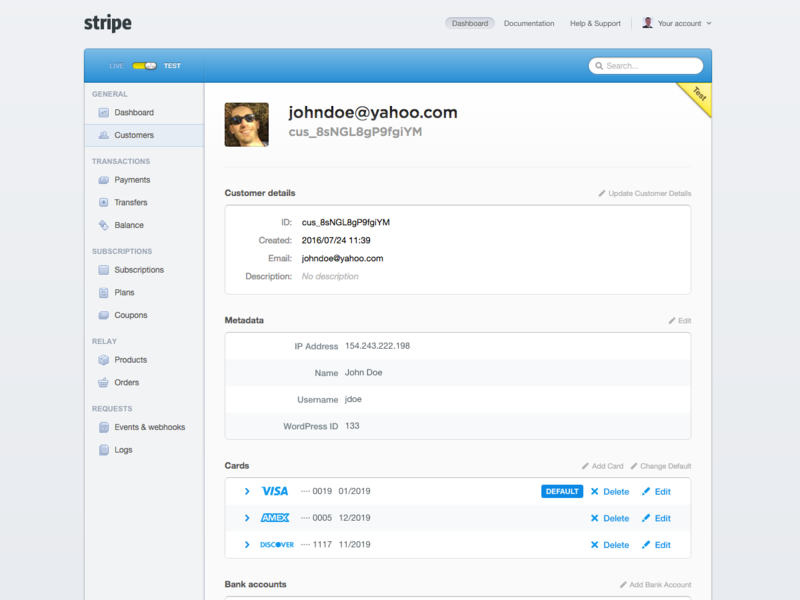 An existing or new Stripe account. A valid SSL certificate on your web server. Contact your host provider for info on how to buy and install the SSL certificate. Note: You can actually complete the install guide below and test your site without a valid SSL certificate. Log in to your Stripe account and in the top right corner, click on “Your account” => “Account settings”. In the popup window, click on the “API Keys” icon. There you will see your unique API keys which are required for this plugin. Open a new browser window and load up your website. Upload the plugin via the WordPress admin page. Once activated, you need to configure the plugin settings. Scroll to the bottom and enter the API keys from the Stripe website in your other browser window. Tick the “Test Mode” checkbox and then save. Now go back and complete the general options. Below is our recommended setup for testing. Before you can begin using Stripe, you need to enable it as a payment method. 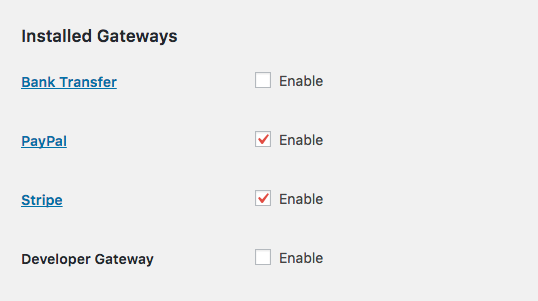 Go to “Payments” => “Settings” => “Installed Gateways” and tick the “Stripe” checkbox. Since your Stripe plugin is in test mode, we recommend performing a test transaction. Of course, your main site should be in maintenance mode or not available to the public during this time so visitors don’t get stuck checking out. Once you purchase a new ad, business listing, coupon, job listing, etc make sure to select the “Credit Card” option when checking out. That will take you to the Stripe payment page. In this case, we’re using the ClassiPress theme. From there, enter one of the following ‘testing’ credit card numbers. Use any future expiration date, fake cardholder name, and CVC. Note: For a full list of test cards and other parameters to test against, see the Stripe testing page. You should get a successful transaction and see it recorded in both the Stripe dashboard and under your “Payments” => “Orders”. If you also click on the “Customers” sidebar link, you’ll see the new customer created with all relevant details. Your AppThemes website order history screen. Now that you’ve made a successful test transaction, you’re ready for the big leagues. 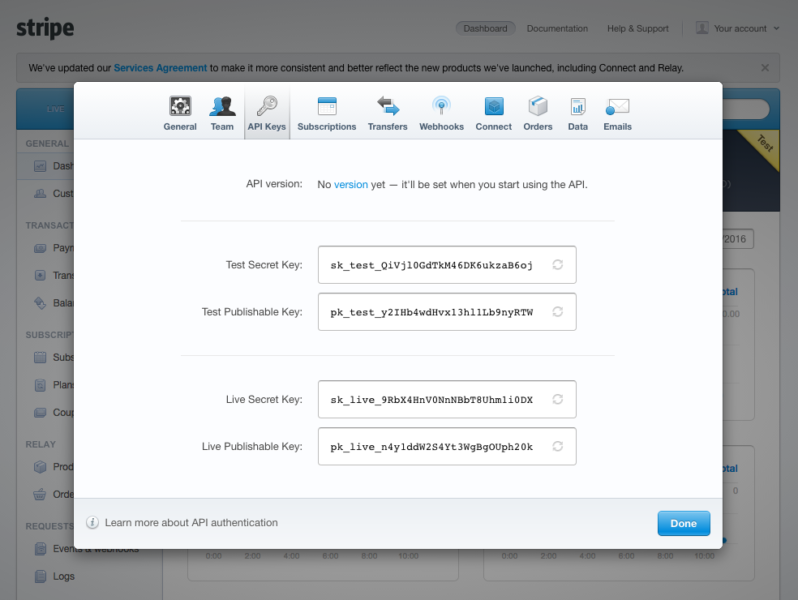 Go back to the Stripe plugin general options page and uncheck the “Test Mode” checkbox under the “API Keys” section. You’ll also need to tick the “Secure Checkout” checkbox assuming you already purchased and setup your SSL (https) certificate. Then go back and try another transaction but don’t actually pay for it. Just make sure everything works correctly. Also, disable any maintenance mode plugins your site was using (if any). To view any real transactions within Stripe, you’ll need to change to “live mode”. Slide the switch in the top left corner from within the Stripe dashboard. Good luck with your sales! If you have any questions, please ask our support team in the Stripe forum. Customer didn’t get created? Transaction didn’t go through? Visit your Stripe dashboard and view the log section. Click on each log entry to see the details. That should give you more information. If you still can’t figure it out, make sure to copy that info and include it with a new forum thread (see support tab above for link) so we can better debug things. Note: If you are not using an AppThemes theme, this plugin will not work. Implemented Stripe Connect (escrow) feature. Updated Stripe API and SDK to the latest versions. Bug when using several cards by a single customer. Fixed PHP undefined variable notice in appthemes_stripe_customer_args filter. Should fix unable to create customer error some customers had issues with. Reworked how .mo language files are loaded. Check wp-content/languages/ locations. Should be triggered on init. Fix bug where users that made purchases while in test mode had errors when the gateway went to live mode. Added documentation to all Stripe Gateway methods. Updated gateway to fall in line with Stripe API changes. Fixed bug where form did not submit via POST. Recurring Payments is now supported. Option added to allow enabling of Stripe Checkout support. API Keys are now trimmed of whitespace before use. Payment form is now displayed below errors. Add Name/CVC/Address checking to add additional security. These can be enabled through the Stripe settings. In a few minutes I was ready to get payments. Great! 2.01 not functional in hirebee. It is also asking for an additional fee to upgrade. Not even close to what the prior version was. Please update this paid plugin. This plugin seems to work fine on my site. I’ve been using it since 2013 and haven’t had any issues. No support on how to connect to stripe.com, Stripe doesn’t even support this plugin. Still waiting for a response in the support forums from AppThemes. Stripe.com has no phone number to call and PayPal does. Thanks for your review. The Stripe team doesn’t support this plugin…we do. 🙂 Our support team will happily answer your questions in our forums. FYI, Stripe has it’s own support channel which you shouldn’t need to use unless it’s related to their system (e.g. something with their website or your Stripe account). The plugin does look really bare. Not what I was expecting for $39. Wish they will give it a more professional look. SSL looks just like html. Seems like the stripe plug-in is bare bones. Does not provide the good stuff PayPal does. Am I missing something? Seems too bare. Thanks for your feedback. As of version 1.2.0 (Aug 2016), the plugin integrates much better with all our themes. We’ve also added a bunch of new features which you can see from the screenshots above. It says there are 146 comments, but they are hidden, why? I was going to buy this plugin, but have received a number of comments saying it doesn;t work, asks or more money and is not recognise dby the theme. Hi @mdinardo, If you are experiencing issues, please do post a thread in the AppThemes forums where support is provided specifically for this plugin here: https://forums.appthemes.com/stripe/. Thanks. @russmichaels – Comments are not hidden, you simply need to select the “Older Comments” link to view the previous pages of comments. There are no known issues with the plugin, we are confident it works with our themes as expected. When my customers are connecting into stripe (using stripe payment gateway), they are asked to register as company. Where can it be change? Is the new rules implemented??? Starting in September 2019, a new regulation called Strong Customer Authentication (SCA) will require businesses in Europe to request additional authentication for online payments. We recommend that all European businesses start building their Stripe integrations with either our PaymentIntents API or our new Checkout to be ready for these rule changes. Replace Google Maps with Bing Maps on your AppThemes website. Jump start your Clipper site with affiliate deals from Rakuten Marketing.